The first episode of “Know Your Bass Player” we discuss the Steve Harris bass from Iron Maiden. Steve Harris is renowned for being the mover and shaker of all things Iron Maiden. One of the starting members of the band, he’s been with the group since the inception in 1975. Steve takes on almost all of the creative roles and not only the bands bass player. He is the song writer, backing vocalist, studio keys player, audio producer and video director to name just a few. The contribution of Iron Maidens’ New Wave of British Heavy Metal brings not only music to define a genre but techniques used by many bass players all over the world today. Techniques such as the Heavy Metal Gallop, Hammer ons, Pull offs and even harmonics which have largely influenced his sound. Steve has a timbre which allows his lines to be heard at loud volumes. 1972 Fender Precision with different paint jobs. Royal Blue, Glittered Blue, Cherry Red, Checker and White. All had a chrome plated mirror scratch plate. 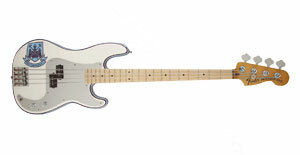 Steve Harris Fender Precision* Custom. White with Maroon-Blue-Maroon pin striping and West Ham F.C crest. SPB1 Seymour Duncan Pickups and a maple neck. Cabinets Up to 8 Marshal 4×12″ cabinets* fitted with EVM-12L speakers. Heavy Metal Gallop A rhythm of three notes played (one 8th note and two 16th notes) played in a fashion similar to a horses gallop. This rhythm is found throughout the Metal world. Minor Scale and Minor Pentatonic scale These shapes whilst subtly different are the foundation of almost every Iron Maiden song chord progression, solo or fill. Hammer ons and Pulloffs To fret a new note without plucking it. This uses the momentum of the original note to transfer the sound. A pulloff is the opposite, where you lift off a vibrating note. The Know Your Bass Player series covers all the popular bassists out there. Analysing their secret sauce, stories, techniques and gear. Watch the whole series by clicking on the thumbnails below or visit the YouTube Channel WhichBass learn from the experiences of these masterful players and apply it to your own style. Out now is our second video debut Flea Know Your Bass Player. Have you enjoyed your time here?! Would you like to know when the next video is out? *Some of the links above are affiliate links, which means that if you choose to make a purchase from that site, we will earn a commission. This commission comes at no additional cost to you and helps support our site.